We are experiencing a moment in history where technology will surpass the power of the human brain. Many of us who are old enough to read this post, have already lived through one of the single most important inventions in human history. This invention is greater than the wheel, the discovery of fire, or the use of simple tools. This invention is known as the integrated circuit, also commonly referred to as the microchip. The invention of the integrated circuit is primarily accredited to Jack Kilby in 1958. Like any great invention, Kilby’s solution was in response to a design challenge. His challenge was that computers were large and cumbersome because of all the separated parts. The simple genius of the integrated circuit placed these elements and the connecting wiring onto a single crystal chip. Kilby linked together these elements with a thin layer of silicon, a semiconducting material. The silicon completed the circuit between the electronic components. All the building blocks of an electronic circuit were now on one chip. This revolutionized the electronics industry, as well as technology, economics and sociology. The first commercial logic chips were announced in March, 1961 and were bought by NASA, the U.S Air Force, as well as by numerous commercial firms. Although only a few thousand chips were sold in 1962, that year marked the beginning of mass production of integrated computer chips. Resembling a primitive organism, the microchip is very basic, relying on a “flip-flop.” An electric pulse makes the chip “flip” into one electrical state until another pulse causes it to “flop” back to its original condition. The combinations of flipping and flopping are what execute the logic, arithmetic, and computations. This flip-flop is made possible by the amazing non-metallic substance, silicon. Next to oxygen, silicon is the most abundant element in the earth’s crust. In order for the electrical current inside a transistor to be switched between being on and off, the transistor must be made from a material whose electrical properties are changed by applying a voltage. For most metallic materials, such as copper, this doesn’t happen. These tiny transistors are the electrically-controllable switches containing the flip-flop mechanism. The application of an electrical signal, a voltage, to one input of a transistor can turn on or off the flow of electricity going through a channel within the device. By connecting transistors into an interconnected system, the circuit can perform complex calculations. So enough about the history and the mechanics, what are future projections? According to Moore’s Law, there is a long-term trend that shows that number of transistors and computational power doubles approximately every two years. Not only does the number of transistors double, but the size and cost of the transistors decrease exponentially. The average cost is now much less than one penny per 10,000 transistors. Moore’s law also verifies that the integrated computer chip is the driving force of technological and social change in the late 20th and 21st centuries. We will live to see a major paradigm shift as the computer chip becomes more intelligent than the human brain and merges with our biological systems. Announced this week by MIT, here is a prototype computer chip designed to mimic how the brain’s neurons adapt in response to new information. This phenomenon, known as plasticity, is believed to underlie many brain functions, including learning and memory. Here, a rat nerve cell attached to a semiconductor chip has successfully exchanged signals with the chip. This achievement will lead to organic computers that process information like a brain. In the long term, the technology also could lead to prosthetic limbs that are controlled by a person’s brain and nerves. Nerve cells here have been successfully threaded into semiconductor tubes, paving the way to brain-computer interfaces that would route nerve cells into specific circuitry. Granted, we are still far away from an integrated computer chip functioning at the same capacity of our brain, because it still takes about 400 transistors incorporated into the silicon chip to simulate the activity of a single brain synapse, but these recent advancements and the quantitative proof of Moore’s Law may show that the threshold is near. One scientist who is convinced that the tipping point is near is Ray Kurzweil who has popularized the idea of the Singularity, the moment within a few decades where machine intelligence surpasses human intelligence, representing a rupture in the fabric of human history and a major paradigm shift from biological thinking to a hybrid of biological and nonbiological thinking. Although this theory is indeed exciting and hopefully sheds interest on the moment we are alive, this short essay is also meant to share how inspiring the potential of a single idea, and the outcome of design simplification processes can be. Some ideas and processes, such as Jack Kilby’s integrated circuit, may even have the power to change the world. “CCMR – Ask A Scientist!”, n.d., http://www.ccmr.cornell.edu/education/ask/index.html?quid=37. “Computer Chips Wired With Nerve Cells : Discovery News”, n.d., http://news.discovery.com/tech/computer-chips-nerve-cells-110321.html. “Dual-Core DSP: More About How Diopsis Operates”, n.d., http://electronicdesign.com/article/digital/dual-core-dsp-more-about-how-diopsis-operates7823.aspx. “File:ARMSoCBlockDiagram.svg – Wikipedia, the free encyclopedia”, n.d., http://en.wikipedia.org/wiki/File:ARMSoCBlockDiagram.svg. “File:Diopsis.jpg – Wikipedia, the free encyclopedia”, n.d., http://en.wikipedia.org/wiki/File:Diopsis.jpg. “File:Microchips.jpg – Wikipedia, the free encyclopedia”, n.d., http://en.wikipedia.org/wiki/File:Microchips.jpg. “File:Transistor Count and Moore’s Law – 2011.svg – Wikipedia, the free encyclopedia”, n.d., http://en.wikipedia.org/wiki/File:Transistor_Count_and_Moore%27s_Law_-_2011.svg. “Integrated Circuit – History of the Integrated Circuit”, n.d., http://inventors.about.com/od/istartinventions/a/intergrated_circuit.htm. “Integrated circuit – Wikipedia, the free encyclopedia”, n.d., http://en.wikipedia.org/wiki/Integrated_circuit. 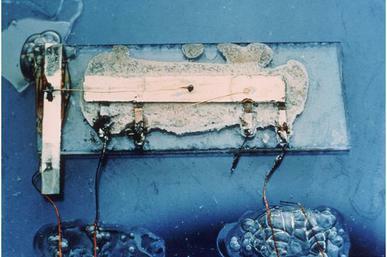 “Kilby_solid_circuit.jpg (JPEG Image, 600×399 pixels)”, n.d., http://upload.wikimedia.org/wikipedia/en/4/42/Kilby_solid_circuit.jpg. “Law of Accelerating Returns”, n.d., http://lifeboat.com/ex/law.of.accelerating.returns. “Moore’s law – Wikipedia, the free encyclopedia”, n.d., http://en.wikipedia.org/wiki/Moore%27s_law. “Moore’s Law to roll on for another decade – CNET News”, n.d., http://news.cnet.com/2100-1001-984051.html. “Organic computing – Wikipedia, the free encyclopedia”, n.d., http://en.wikipedia.org/wiki/Organic_computing. “Prototype computer chip attempts to mimic human brain”, n.d., http://news.medill.northwestern.edu/chicago/news.aspx?id=195406. “Science and Invention – When Was The First Computer Chip Developed? : History Fact Finder”, n.d., http://www.enotes.com/history-fact-finder/science-invention/when-was-first-computer-chip-developed. “Silicon Chips Wired With Nerve Cells Could Enable New Brain/Machine Interfaces [Archive] – FrostCloud Forums”, n.d., http://www.frostcloud.com/forum/archive/index.php/t-27294.html. “System on a chip – Wikipedia, the free encyclopedia”, n.d., http://en.wikipedia.org/wiki/System_on_Chip. “The Chip Collection – STATE OF THE ART – Smithsonian Institution”, n.d., http://smithsonianchips.si.edu/augarten/p10.htm.